The IRS uses Letter 2205 to notify you of an audit - it could be either a field audit or an office audit. 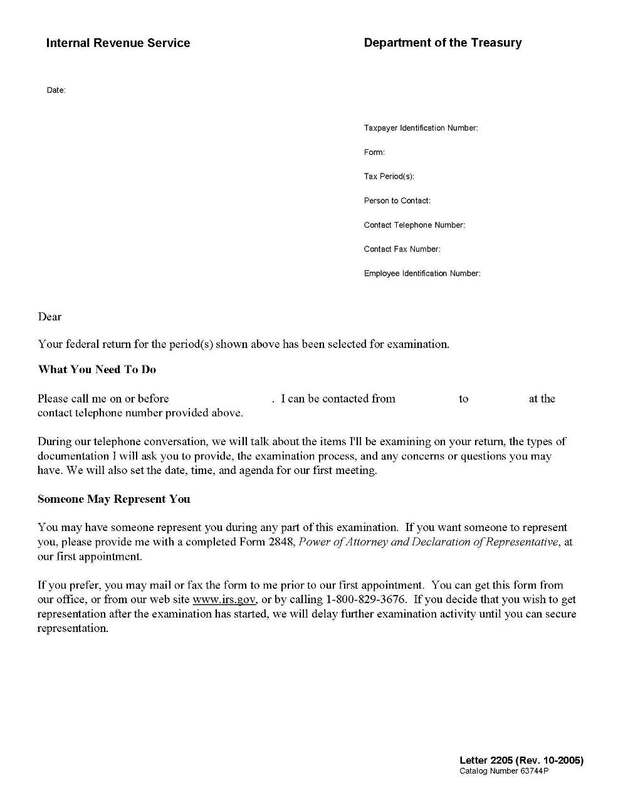 With this audit letter you can identify what type of audit you are facing and the agent's name, phone & address to write down but it is not extremely important otherwise. What is more important is the Form 4564 or Form 886A which the IRS always sends to request information from you. These forms are extremely important because the IRS will want their questions answered by you. The evidence required to prove your case is more than just a lot of cancelled checks or even an accounting software program or printout. Each element of every item must be proven with specificity & in the format required by the IRS or you will be rejected. The TaxHelpAudit program gets you prepared for your IRS audit by showing you what evidence to get for every line of every IRS form & how to put it together while TaxHelpLaw gives you Tax Attorney guidance along the way! Please determine if you received a Form 4564 or a Form 886A. Then, click on the links for the Form 4564 or the Form 886A to find out what to do next to save time and money! If the IRS questions relate to your Schedule C, Form 2106, or Schedule E, please purchase and follow the TaxHelpAudit Business Program. If the IRS questions relate to any other Form or Schedule, please purchase and follow the TaxHelpAudit Individual Program. To see how our Programs work see the Empowerment page! Lost Documents: You may be fearful of an IRS audit because you didn't keep your records or your records are lost or unavailable. However, unless you only used cash, you can re-create bank records & credit card records. Even if cash was used, affidavits can be obtained or we can use industry standards to arrive at a reasonable figure. See TaxHelpLaw - Lost Documents.